NOKIA is one of the mobile phone giants that for the past ten-fifteen years dominated the industry with devices for all ranges. During the past two years, though, something was going really wrong for them as they had a really hard time catching up in the smart phone range with the likes of iPhone and Android devices. Earlier this week NOKIA's CEO, Stephen Elop, admitted in an internal memo that they are sitting in a "burning platform". Today they announced their partnership with Microsoft to fully incorporate Windows Mobile with their hardware. I am not sure how this played out. It is sudden and happend a few days after the memo was leaked. Does this have anything to do with it? Or maybe the memo was leaked to pave the way for the announcement. Either way I am sure that NOKIA's CEO being an ex-Microsoft executive played a role. Even though I am an Android user and respect what iPhone has brought to the industry, this is very interesting stuff. Micrososft was struggling for years to get decent Windows phones in the market and utilise(or capitalize on, if you prefer) their existing services. Crappy software and bad implementations was dooming the windows phones to annoying unusable gadgets. This is different though. 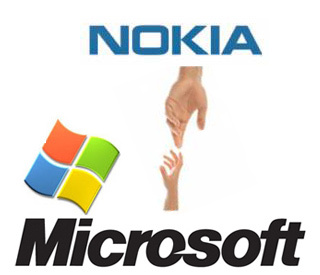 NOKIA knows how to produce good hardware but they lack the services and the cutting edge software. Developers were limited on both sides since Windows did not have the install base to interest them and NOKIA did not have decent software to produce a wide range of apps like we see on iPhone or Android devices. Bringing them together creates a mobile phone ecosystem that can rival the other two big players in the market, namely, Apple and Google. In the following video you can watch NOKIA's CEO and Microsoft's CEO, Steve Ballmer , announcing the alliance. It is an interesting watch.